The adidas Aerobounce is a lightweight and affordable trainer that likes to build up the speed. It is a good tempo/track trainer. 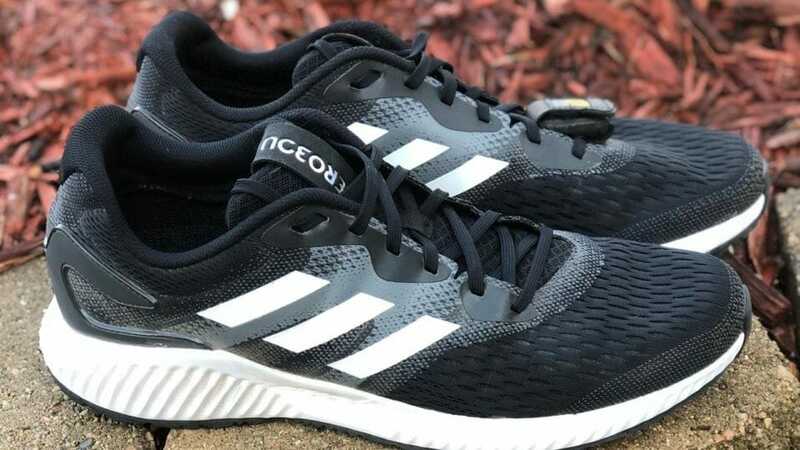 This shoe is for a lighter runner or someone who is working on speed (tempo, hills and track workouts) while on consistent surfaces. 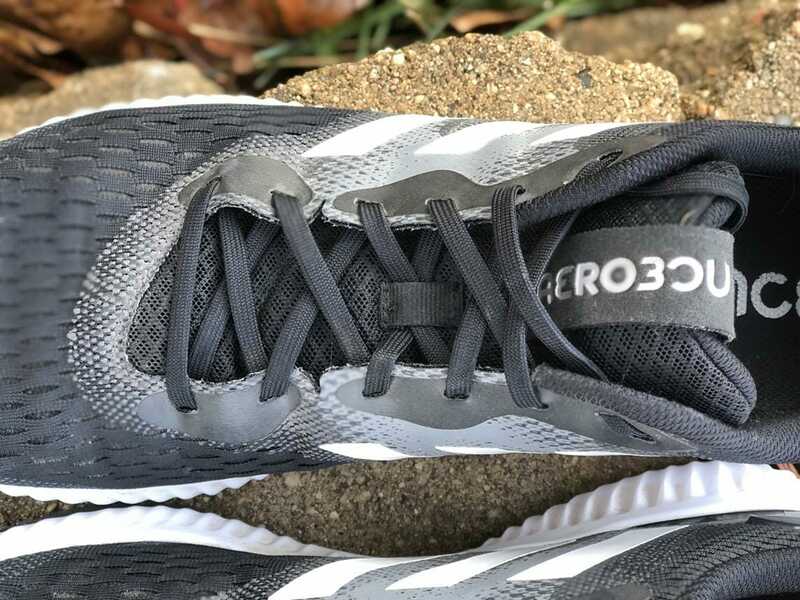 The adidas Aerobounce is a new shoe by the company using their all new Bounce midsole. This shoe delivers in its name. The shoe truly feels bouncy. 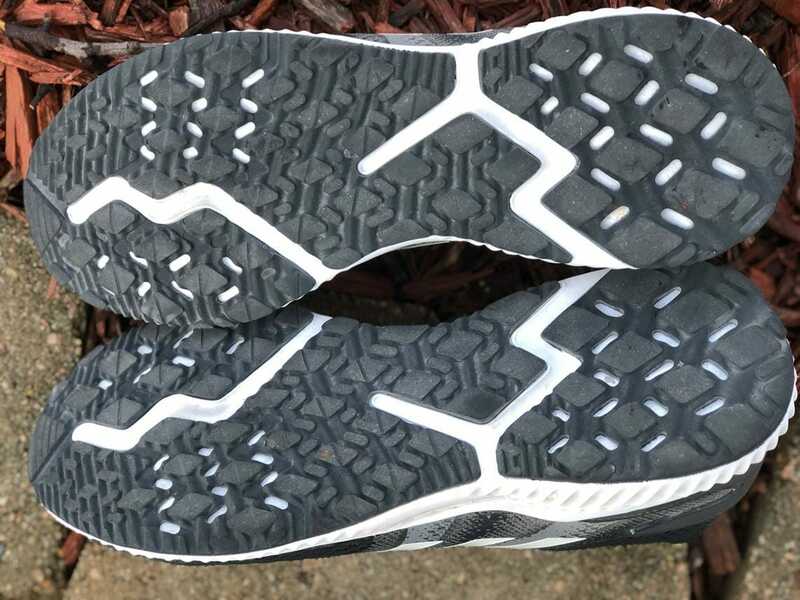 However, the low stack height and the soft materials of the outsole and midsole mean that you will feel every bump on the road (both good and bad). The price point of this shoe is around $90-100 but can be found at around $70 fairly easily. As a new model, there are still some functions of this shoe that seem to be in the testing faze. However, it is a nice fast-paced runner that won’t break the bank. This shoe is a new one for the adidas lineup. They are to be one of the go to affordable trainers for the company. Although not on the level of the Ultra Boosts or something along those lines, the price tag will open up the market for many more runners. At this price point they will likely compete against the Brooks Launch and Revel, the New Balance Fresh Foam Zante (v4), Nike Zoom Strike/Free Run RN and the Under Armour Charged Bandit. That is a list of great shoes that are all at a competitive price. When these shoes arrived, I was very pleased with the unboxing. The look of them is understated but very nice. The colorway I received was the black and whites. This combo goes with almost any combination of other gear. When I put them on, they were very comfortable for my all-day test. On my first run, they were quick and bouncy. The sole unit of the Aerobounce provides a lot of talking points. 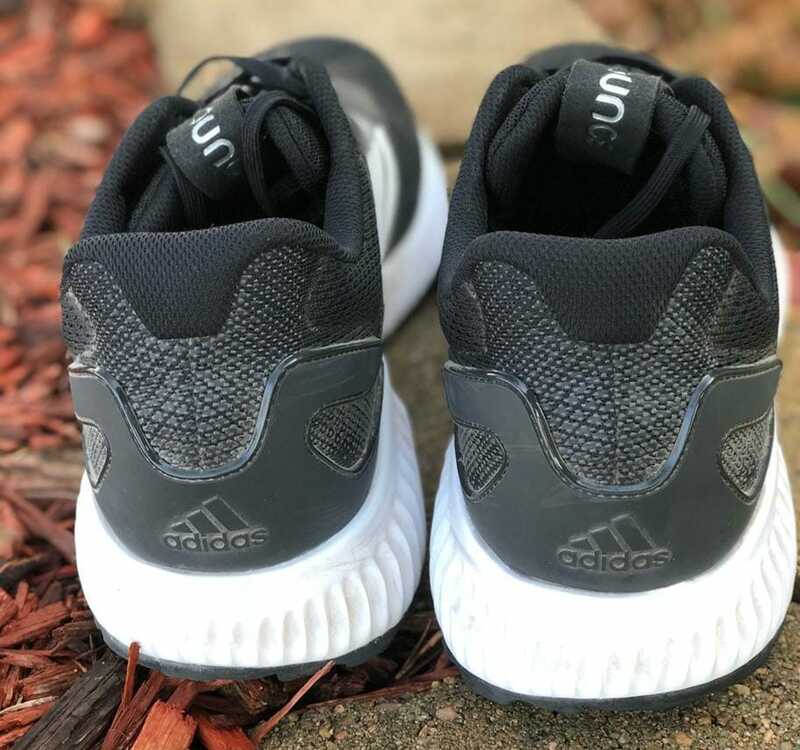 Using adidas new Bounce midsole technology, this unit gives a ton of energy return without adding too much weight. With a 10mm heel-toe-drop (28 mm heel stack), this shoe falls into the normal category. The forward lean that it forces upon you, will help you to push forward with more speed. 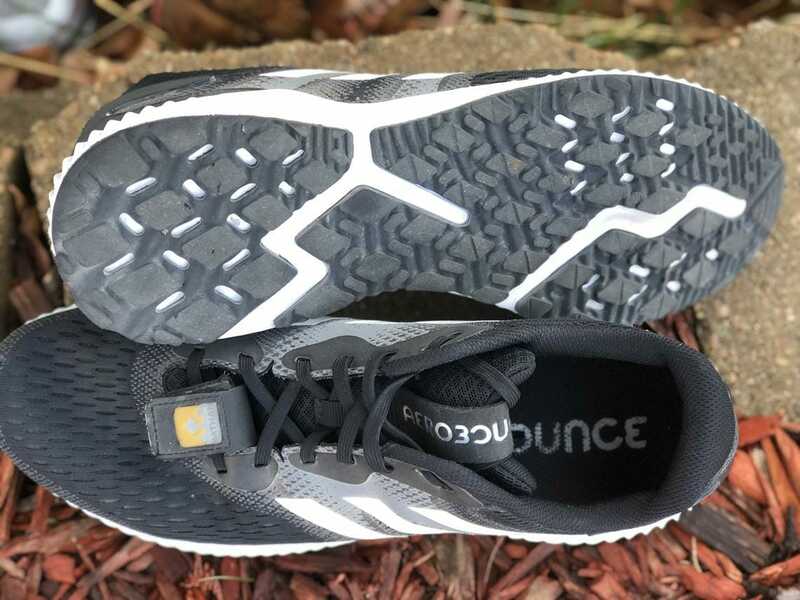 Using the Bounce midsole, coupled with a blown rubber outsole, the unit provides a cushioned feel on the road while allowing you to feel the ground underfoot. The soft materials are perfect for the road/sidewalk and the track, but they do not work well on other surfaces. When I took them on crushed stone and gravel, the larger rocks would poke through the unit and into my foot. A little poke here or there is no big deal, but it was enough that I had to really think of what surface on which I would be running before lacing up. The outsole had a good amount of traction while not going overboard. I never felt unstable, but also never truly felt as though I was gripping the road. This was fine for most runs, however, when it was wet outside and I had to take a corner, I like to have that feeling of safety. The other part was that for a runner of my size, these shoes seemed to give out on longer runs. 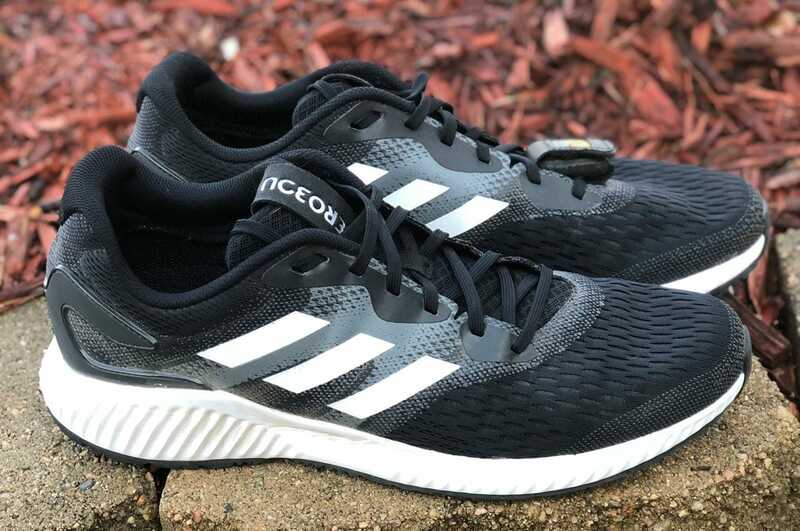 I believe they would be great for 10+ miles for smaller runners, but by the end of the 10 and the 12-mile runs that I did in them, my feet felt beat up. Overall, the sole unit is nice, and great for tempo runs and for just wearing on a daily basis. However, on the long run it wore out before I would want. And the ground-feel was so sensitive that I had to think twice about which surface I would be traversing. The upper is where this shoe really shined for me. It fits perfect to size (my 13 was right on to my expectations) and snug where I want it while loosening up a little in the toebox. Using an engineered mesh with Aramis Haptic Print over the midfoot, the upper grabs your foot while letting it flex and move. I never once felt my foot slip in the shoe, and felt well supported throughout the entire length of the upper. The mesh moves with your foot, and will breathe to keep your foot cool. When you land, the mesh with expand and then tighten up as you roll through your toe-off. Soft enough to be comfortable without socks, the mesh is truly a marvel. The print area on the midfoot seems to lock the foot in place and adds some needed structure to the shoe. When coupled with a rigid plastic heel cup, the overall upper truly supports and locks your foot in and cradles it through the entire stride. 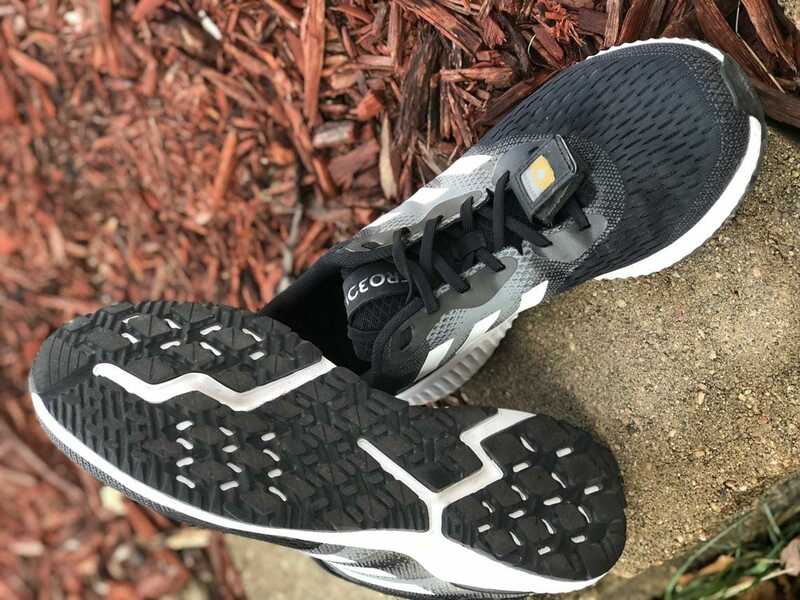 The adidas Aerobounce is a very good tempo and speed shoe at a very affordable price. It is one of those shoes by which I was surprised when I got on the road. Yes, it has its flaws. However, I think those are far outweighed by the positives. 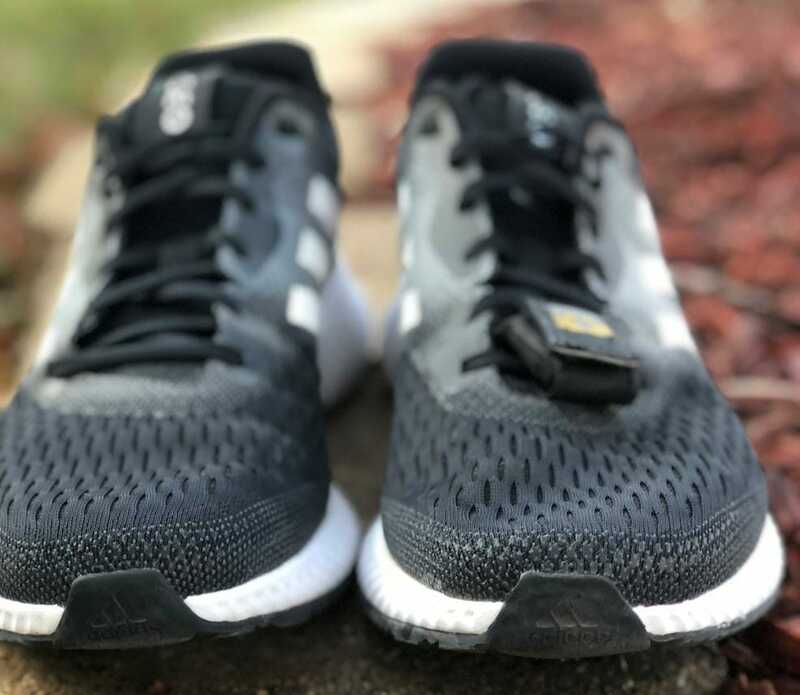 At the price point of $100, it is a good shoe. But considering I can already find it online for $65, it is a steal. This is definitely a best buy, and one that I plan to continue using from time to time to ratchet up the speed. 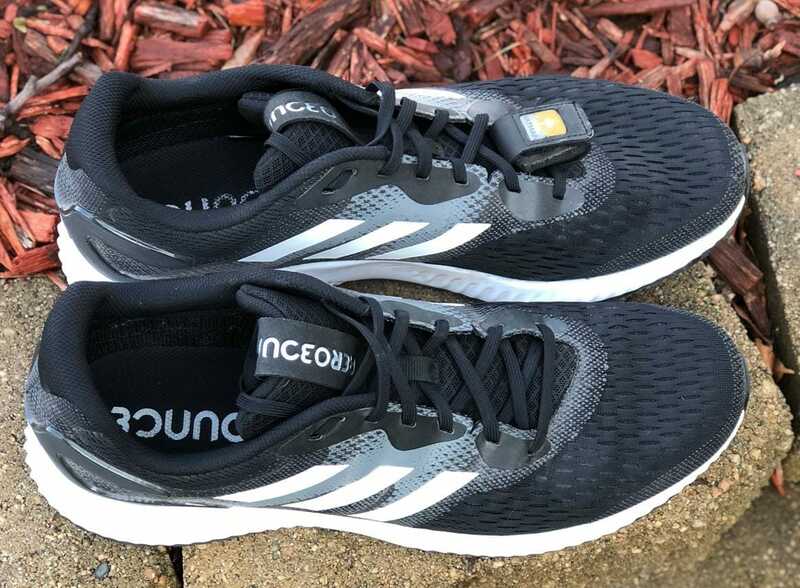 We purchased a pair of Adidas Aerobounce from runningwarehouse using our own money. This did not influence the outcome of this review, written after running more than 50 miles in them.